will be welcome at an ALERT Family Night and Orientation in September! Max Deutsch is a self-described speed learner. ​He recently gave himself one month to learn to play chess . . . well enough to take on the world champion. Did Max beat the world champion? That might be the wrong question . . .
Mastering a skill requires a conscious decision; it is not something that "just happens." Recording and reflecting on progress or setbacks helps you increase in skill. When you attempt to reach extraordinary goals, you meet extraordinary people. Live a life a little less ordinary . . . what will you do this summer? by Laura McClure, TED-Ed Editor. 1. Design your own learning adventure. ”What you are in love with, what seizes your imagination, will affect everything,” wrote Pedro Arrupe. “It will decide what gets you out of bed in the mornings, what you do with your evenings, how you spend your weekends, what you read, who you know, what breaks your heart, and what amazes you.” What do you love to do? What experiences do you want to have? How much time and energy are you willing to commit to practicing a new skill? These are your primary creative constraints. To find a way to learn more about what you love, check out the nerd’s guide to learning everything online. 2. Schedule fun, weekly field trips to follow your curiosity. Julia Cameron calls this practice “the artist date” — and describes it as “a once-weekly, festive, solo expedition to explore something that interests you.” For example, you might visit a museum, art gallery, or science center; go for a long walk outside in a city, campus, or park; or seek out live music and performance. The specifics are up to you! 3. Keep an idea notebook. If ideas are butterflies, notebooks are nets. Whether you carry a pocket-sized sketchbook, a bunch of index cards with a rubber band around them, or a digital notepad, the important thing is to capture the ideas, dialogue, or patterns that draw your attention, because that’s how you start to find wonderful ideas. 4. Try a 10-day creative challenge. 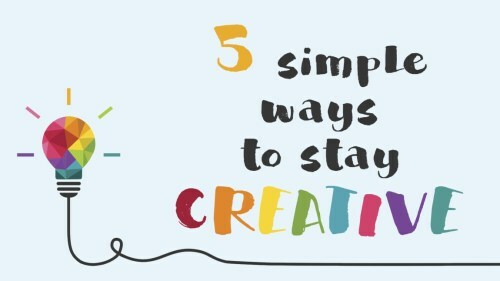 The idea is simple: for 10 days, spend 20 minutes a day in active creativity. Document your progress. Not sure where to start? Try these creative writing prompts. 5. Get a library card and read, read, read. Every great book is a portal — to adventure, to knowledge, or to new perspectives. Libraries make it easy for you to follow your curiosity and stay creative. If you don’t yet have a library card, now’s the time to get one. Not sure what to read? Try something from the world’s required reading list.